We know by now that you get better reach with your Facebook posts if you get more engagement from your fans. When trying to promote your gig dates, how can you make this happen? Here’s what I like to do. Post a picture of the crowd at your last gig, ask people if they can spot themselves. This should create likes and replies from fans who were there increasing reach. However, within that post call forward to your next gig asking future attendees if they are coming/excited etc which again should boost reach. In theory you are using the promo and goodwill of your last event to help promote the next event. Be sure to tag in the names of the venues as well (use the @symbol and start typing their Facebook page name). This will also work on Twitter. 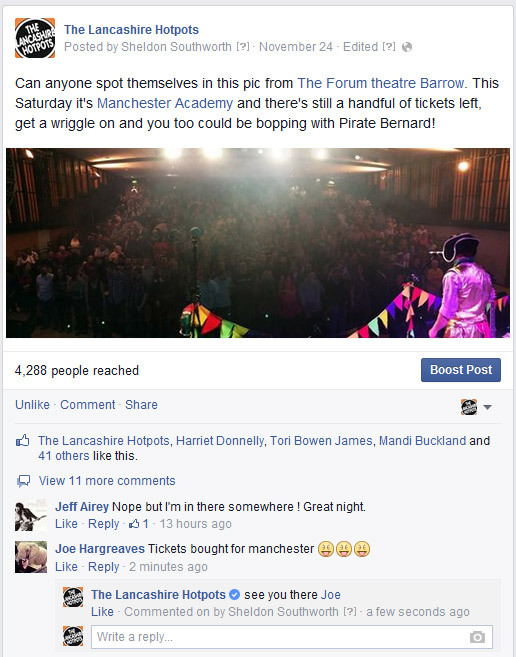 Tweet a pic of the asking people to RT if they can spot themselves and give a URL for tickets for your next gig. Include the Twitter handles of both venues.